When external markets were less favorable, POET looked inward for growth. In the previous issue of Vital, we told the story of POET’s name change, which culminated with a surprise appearance from Neil Armstrong. Now armed with a new name and singular identity, POET was poised to begin its next chapter as an industry leader with new challenges on the horizon. It was 2008 – with the Blend Wall looming and with corn prices on the rise, followed by ethanol companies falling into financial distress and even bankruptcy – the biofuel boom faced its bust. POET Founder and CEO Jeff Broin was nervous about the downturn but still saw some opportunities ahead. “We were entering what would become the most challenging time in the history of the industry,” says Broin. Corn prices rose from $3.00 to more than $8.00 per bushel and several companies filed for bankruptcy. POET had just constructed and brought online six new 65 million gallon plants in Ohio and Indiana. These plants would now require additional financing at a time when banks were turning away from ethanol. The Obama Administration and the Renewable Fuel Standard (RFS) also increased regulation of the industry during this timeframe. During a time Broin describes as “the longest period of slow growth since I’ve been in the industry,” POET was able to thrive by focusing on in-house expansion of capabilities, adding new efficiencies, increasing industry political and public relations involvement and planting the seeds for the future of cellulosic ethanol. 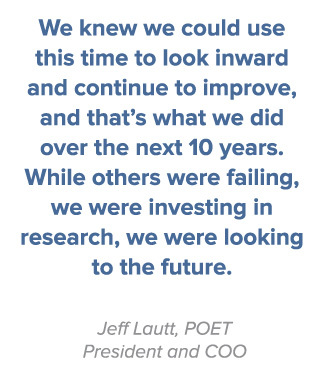 For POET President and Chief Operating Officer Jeff Lautt, 2008 was a turning point for the industry and a turning point for POET. After an era of external expansion – POET had been building biorefineries at a rate of three or four per year – the company realized the nationwide capacity for ethanol production was nearing its saturation point. The previous construction boom would soon come to a screeching halt. The Blend Wall that caused the problem was created by existing laws, Environmental Protection Agency (EPA) regulations and American Society for Testing and Materials (ASTM) rules basically imposing a 10 percent maximum of ethanol in gasoline. Production capacity in the U.S. was now passing that number creating an oversupply. “We saw that coming, and we adjusted accordingly,” says Lautt. “We also saw that our company was growing, becoming more mature, more professional. We knew we could use this time to look inward and continue to improve, and that’s what we did over the next 10 years. While others were failing, we were investing in research, we were looking to the future. We even purchased a 90 million gallon per year ethanol plant in Cloverdale, IN during the downturn and brought it back online. POET also focused on new hiring practices and top-tier training. In a few short years from 2005 to 2010, POET nearly doubled their main office staff to 300 and multiplied the square footage of their Sioux Falls headquarters by six to a total of over 226,000 square feet, creating room for longer term growth. The industry slowdown did not curb POET’s relentless pursuit of research and development, which actually increased during the ten year period. There may not be a better example of this kind of internal project than the origins of POET’s corn oil extraction process. Marketed as Voila, the high-quality corn oil is used for everything from a feed additive for animals, to biodiesel production, to an industrial lubricant. In 2008, POET Nutrition, POET’s Distiller’s Dried Grains with Solubles (DDGS) and corn oil marketing division, was concentrating on continuing to find acceptance in new species of livestock and higher concentrations in feed rations, as well as developing new markets, for Dakota Gold, their branded high-quality source of livestock feed. POET Ethanol Products was also prospering during this same time period. In the mid-1990s when POET recognized the chance for large-scale capture of carbon dioxide, a natural co-product of ethanol production, POET started testing the idea at a pilot plant in Scotland, SD. Today, a dozen POET plants supply the highest grade liquid carbon dioxide to customers across the U.S. for use in everything from fire suppression and flash freezing to beverage carbonation, managed and marketed by POET Ethanol Products. When they recognized the market for denaturant – the substance added to ethanol to make it unfit for beverage use – POET Ethanol Products created a Denaturant Logistics Team and now is the largest supplier in the nation of high quality denaturant. When POET Ethanol Products saw an opportunity to improve their trucking process – a big part of the cost of selling and transporting that CO2 and denaturant, they invested in their own tractors and trailers. In 2015, their trucking company logged over 10 million miles and operated over 100 tractor trailers. And, in 2013, when POET decided the time was right to consolidate grain buying and create common leadership across the company’s 27 biorefineries, they officially launched POET Grain in Wichita as well. That move – consolidating grain buying to one centralized location – required everything from implementing new accounting practices to revamping existing corn bidding methods to communicating these changes to a customer base of tens of thousands of grain producers and marketers. Almost immediately, the reorganization yielded positive results for POET – things like more efficient use of capital, utilization of specialized resources, greater market opportunity and diversified grain portfolio returns. Those involved with POET Grain have also seen something less tangible, but maybe more important – an increase in coordination and communication not only across the company, but also with their customers, the farmers. Today, POET Grain buys the 650 million bushels of grain, nearly 5% of the U.S. corn crop, necessary to produce those 1.7 billion gallons of ethanol per year. That “do it ourselves” attitude, while often focused on POET, carried over onto the national and international stage over this decade as well. In 2008 – with the recognition of the importance of the impending Blend Wall and the realization that Big Oil would ramp up its anti-ethanol marketing campaign – POET began working with other industry leaders in an attempt to consolidate ethanol’s efforts and energy in the public and political arenas. “We felt the current organizations were not doing enough to get us beyond E10,” says Broin. Jeff Broin and Greg Breukelman produced a video and a business plan and set out on a historic venture to unite the Ethanol Promotion and Information Council (EPIC), the American Coalition of Ethanol (ACE) and the Renewable Fuels Association (RFA). In the end, only EPIC agreed to consolidate into an exciting new organization with the right funding and expertise to become the voice of the industry. POET, along with several other ethanol producers, formed Growth Energy in November 2008. From the start, the newfound organization was much more than a trade association. Just 30 days after its founding, the new members of Growth Energy – chaired by Broin – finished crafting the Growth Energy Green Jobs Waiver, which petitioned the EPA to increase the amount of ethanol in the fuel supply to 15 percent. While it started with just 11 members, Growth Energy today consists of 80 plant members and 100 associate members and has become the largest organization representing – and championing – the ethanol industry. It was a long, painful process – the fighting back of every lawsuit brought by the oil lobby and every regulatory hurdle imposed by the EPA, some that still continue – but significant progress was being made. By late 2016, E15 was selling at nearly 400 stations in the biggest cities in America. Within the next few years, an estimated 700 stations will soon offer 9,000 E15 pumps in the nation’s busiest markets. More than 95% of the pumps installed would be flex pumps capable of selling any blend of ethanol. This rapid expansion of higher blends happened because of a program created by the new organization. Prime the Pump, an industry-wide initiative created and administered by Growth Energy, raised more than $60 million from the industry to complement a $100 million grant from the U.S. Department of Agriculture. The money was used for direct grants to independent convenience store companies to convert stations for E15 and higher blends. While it took 30 years for E10 to shift from rural to urban areas, Broin and the Prime the Pump team believe we can do the same thing with E15 in ten years or less by starting in major markets. The plan’s early adopters – those hundreds of gas stations – have seen a competitive advantage with higher income, lower pump prices and higher octane E15. By 2016, POET’s political presence, had grown from two in-house political team members in 2007 to seven and a new POET office in Washington, D.C.
Maybe no single project defines the past decade – and maybe the future – for POET like Project LIBERTY. POET began discussing cellulosic ethanol from corn cobs in 2000. Early research showed challenges in both harvesting and collection of biomass, as well as processing cellulose into ethanol. In 2006, the U.S. Department of Energy announced a grant program for up to $80 million to build a facility. 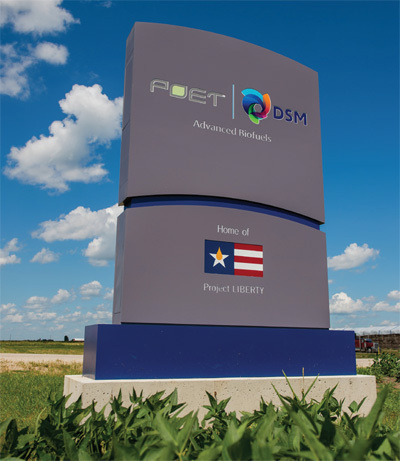 POET applied for and later received this grant to build Project LIBERTY, a 20 million gallon per year cellulose plant adjacent to the starch plant near Emmetsburg, IA. In 2008, POET built Project BELL, a pilot plant to research and prove the technology for LIBERTY. Articles around this timeframe derided cellulosic ethanol as a “fantasy fuel.” At this same time, POET began collecting significant quantities of biomass, starting with corn cobs and later transitioning to leaves, husks and cobs. The $300 million plant in Emmetsburg, IA, is turning corn cobs, leaves and husk into tanker trucks full of cellulosic ethanol as it gears up toward converting 285,000 tons of biomass into a projected 20 million gallons of ethanol annually. The joint venture of POET and Royal DSM (a Netherlands-based leader in yeast and enzyme technology) officially opened in September of 2014, and has already advanced agriculture in the region by allowing farmers to generate a new revenue stream from in-field residue, something never before practiced on a large scale. “Project LIBERTY is the single biggest project of the decade for POET,” says Rod Pierson, Senior Vice President and General Manager of POET Design and Construction. “It’s big in so many ways. It’s big in terms of research and development. Besides ethanol, Project LIBERTY produces biogas from an anaerobic digester and steam from a solid-fuel boiler to produce power to run its own processes and export energy that replaces 100% of the steam needs at the larger starch-based ethanol plant next door. For Jeff Heikes, the POET experience seems like an adventure. POET has come a long way since that day in the early 1980s when, according to family lore, Jeff’s dad Lowell Broin used a pressure cooker on the kitchen stove to test the principles of manufacturing ethanol. What started on that Wanamingo, MN farm has led Jeff and Tammie Broin and their family from Scotland to Sioux Falls to sub-Saharan Africa, where POET created Mission Greenfield, a project designed to improve agricultural yields in Kenya and beyond. In between, Broin stepped down from CEO to Executive Chairman for a short period to focus on philanthropic efforts, then returned to the company he started with a renewed interest and a bigger-picture outlook. One thing that hasn’t changed is Broin’s optimism. For all of the projects over POET’s past decade, for all of the technological breakthroughs, for all of the agricultural advancements, Jeff Broin points to the one constant that has kept the company successful – the people of POET. “I have this kind of optimism for the industry because we have the best people you’ll find anywhere, and we have shown we can accomplish anything with great people,” he says. It’s the kind of corporate camaraderie that has defined POET since the start, and continues to carry them forward into the future.